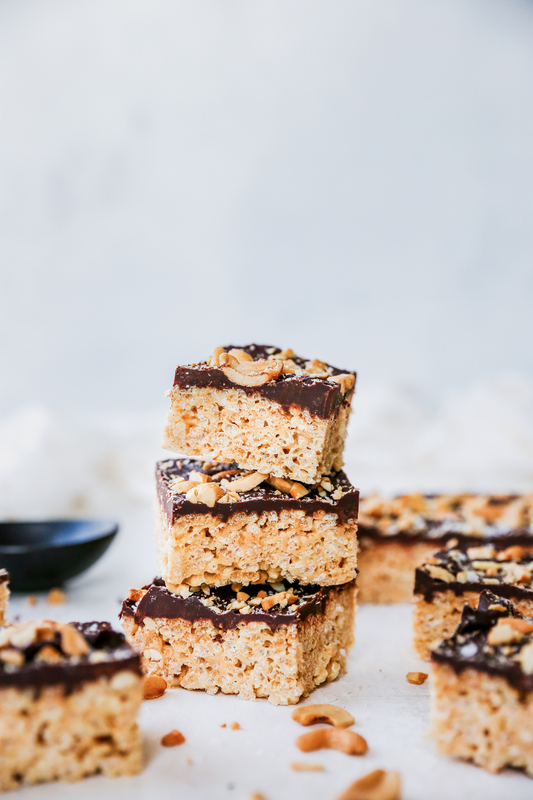 I’m back with another super easy, no-bake, chocolate-heavy, Valentine’s Day-inspired treat! 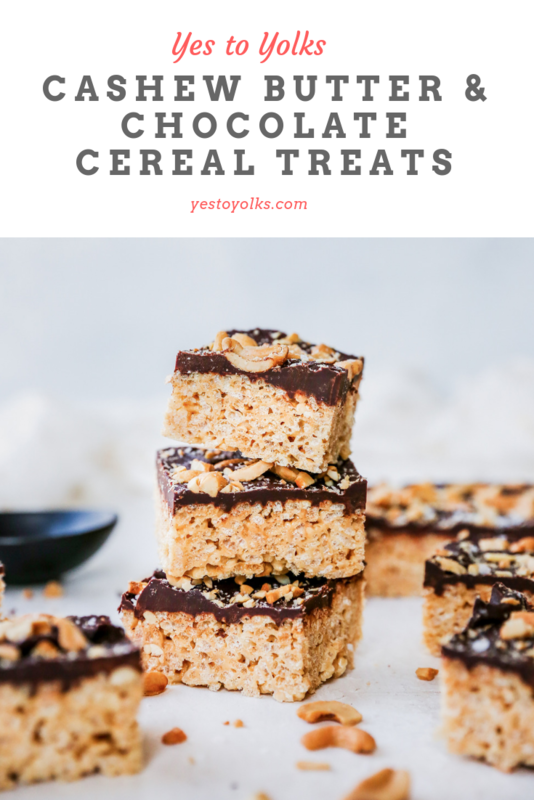 These are a fun and delicious twist on the classic crispy cereal treat, and I think they might be my most favorite version yet. I suspect it has something to do with the salty-sweet combo going on in these, which is my all-time favorite type of dessert. I have always been a fan of cereal treats. They’re super easy and definitely nostalgic. A childhood staple. My favorite part is eating scoops of the warm mixture right out of the pot when it’s extra gooey and soft. I introduced Kieran to this practice, and he was totally on board. Like, we couldn’t get it into our mouths fast enough. Warm, soft, marshmallow-coated cereal? Yes, please. This version features my favorite nut of all the nuts: cashews. I adore them and always have. Dan recently discovered them (took him long enough! ), and now we both swoon over their buttery decadence. A handful of salted cashews is such a satisfying snack. 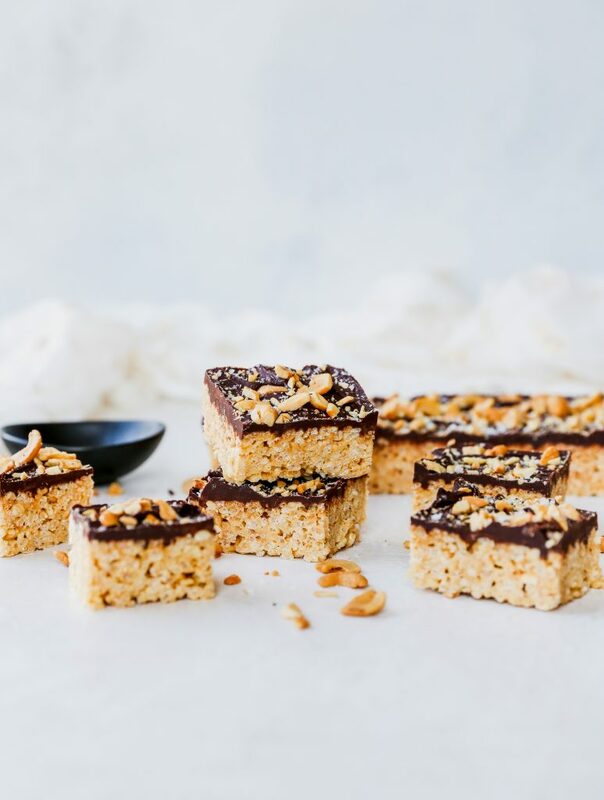 For these cereal treats, I use cashew butter in the marshmallow mixture and then top the finished treats with chopped, salty cashews. Yum. Double the cashew, double the fun. And we can’t forget the chocolate! I used dark chocolate here and melted it simply and poured it all over the formed cereal treats. 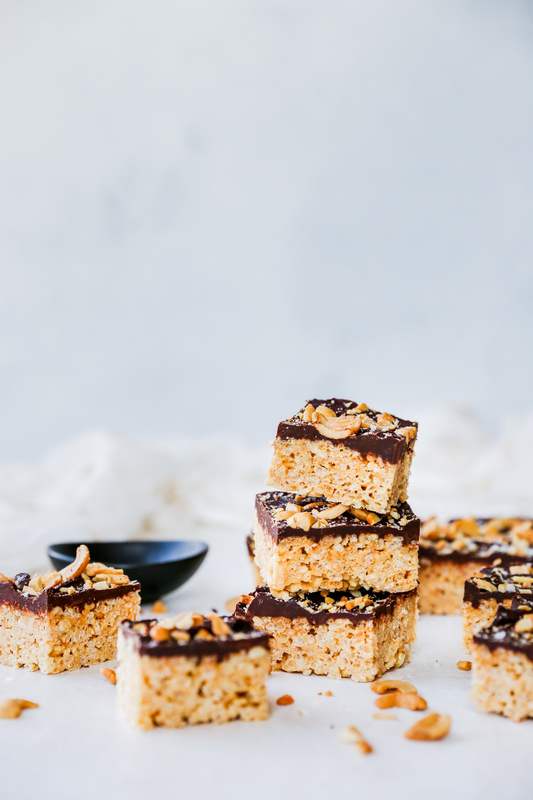 Topping it with the aforementioned cashews and a generous sprinkling of flaky sea salt really takes these into the insanely delicious zone. Feel free to make these your own, too. You can swap in any nut butter/nuts you like, and switch up the chocolate for milk or semisweet. 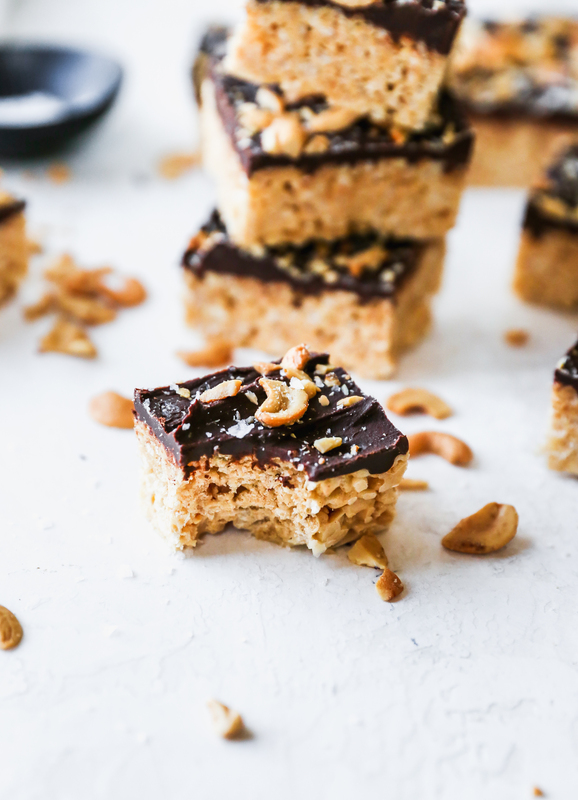 A peanut butter version with semisweet chocolate would be something special. Just sayin’. 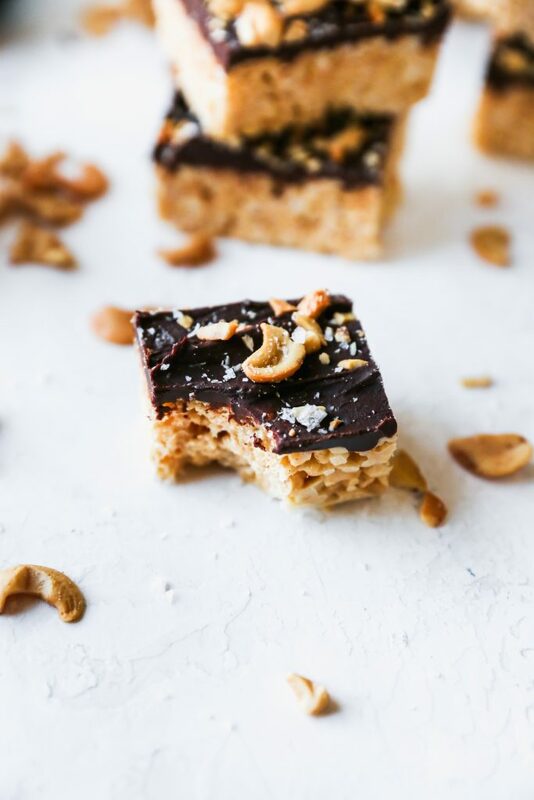 These are an awesome treat to make for your someone special this V-day. Or anytime you want something sweet. I am in full favor of treating yo’ self. I just like to tout treats like this as Valentine’s Day things because it’s easy to do so. Really, I am not above making these at any time or for any purpose. If you aren’t a baker, these are for you. They take minutes to make but look and taste much more impressive. The hardest part is waiting for them to set in the pan, but I promise you, the wait it worth it. Once the cereal treats have set, you can cut them any which way you like. Squares, bars, or even into shapes using cookie cutters. Whatever floats your boat! The world is your oyster, friends. 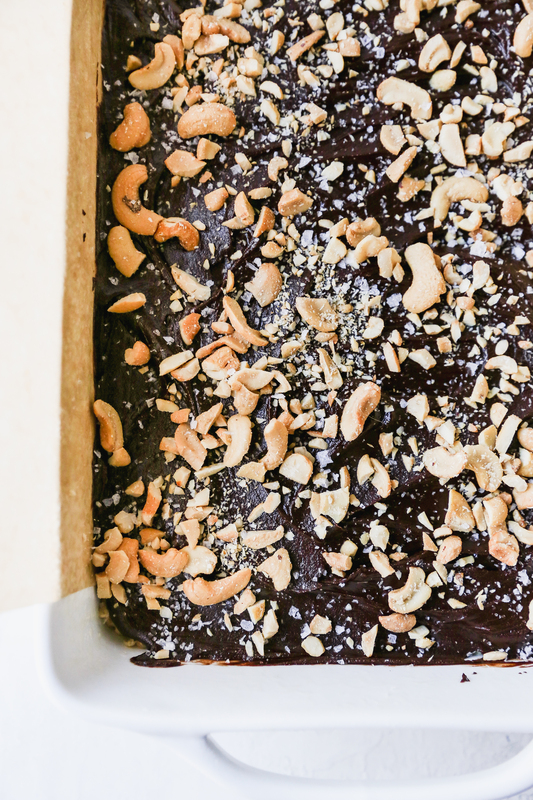 Especially when chocolate and cashews are involved. Spray a 13 x 9 inch baking dish with nonstick cooking spray and line with parchment paper, letting the parchment paper hang over the edges. In a medium saucepan, melt the butter. Add in the marshmallows, cashew butter, and salt and stir until melted and smooth. Fold in the cereal and the chopped cashews and toss to combine. Press the mixture into the prepared baking dish and set aside. Melt the chocolate chips and heavy cream together in a microwave-safe bowl, stirring every 15 seconds until completely melted and smooth. Pour the mixture over the cereal treats and spread out so even. 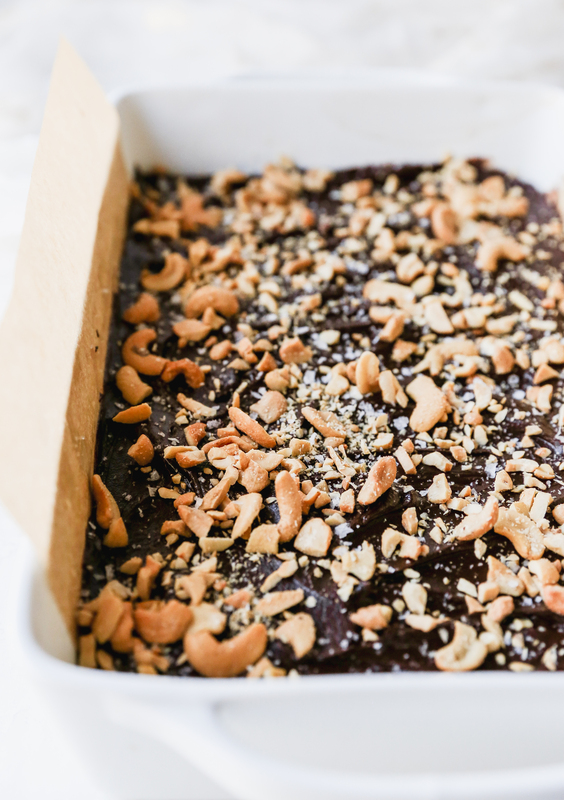 While the chocolate is still warm, top with the chopped cashews and a sprinkling of coarse sea salt. Allow to set until firm. Slice and serve! 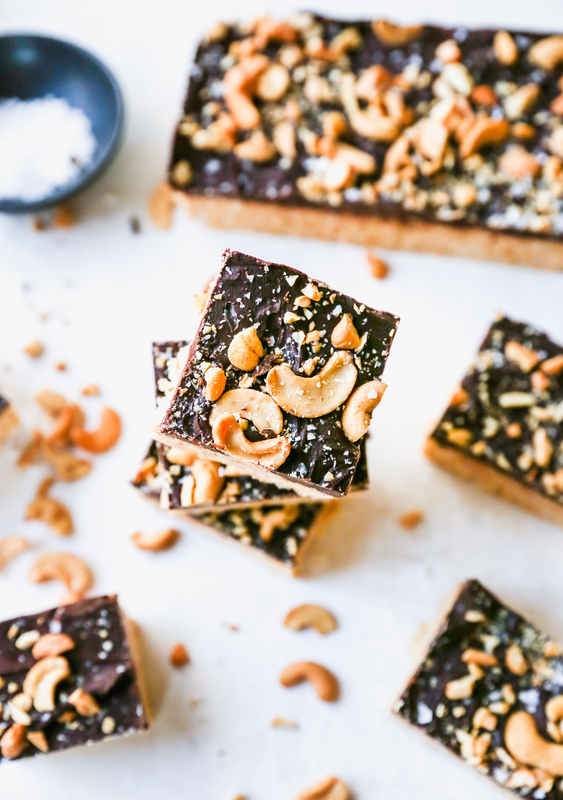 You can make these with any nut butter you like. 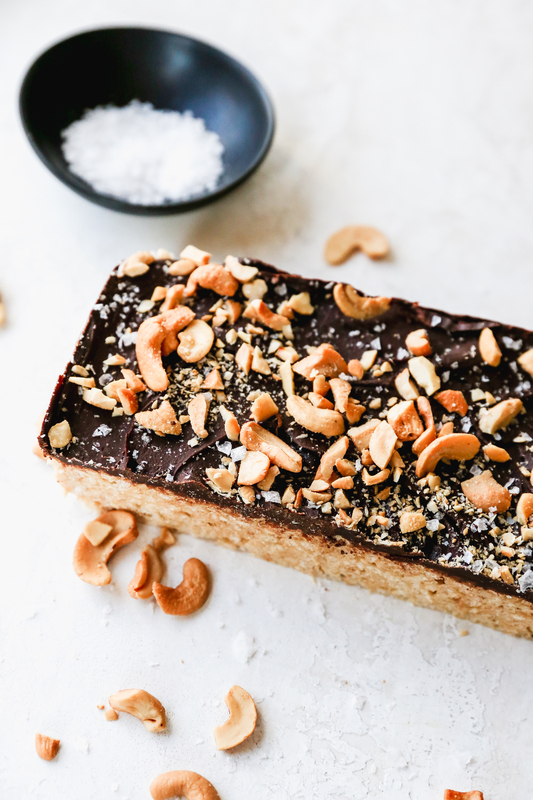 Almond and peanut butters would work just as well here. Garnish with the same nuts as your butter choice.